Since the demise of Boyzone in 2000, Stephen Gately has taken the West End by storm, appearing as the lead in ‘Joseph & The Amazing Technicolor Dreamcoat’ in 2003/04; and most recently as the Child Catcher in ‘Chitty Chitty Bang Bang’. This latest role has shown a new side to Stephen, who is best known amongst his fans for his cute “Gately Grin” and his warm personality. 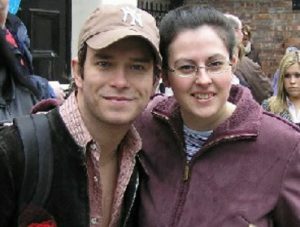 I caught up with him a couple of weeks before his last performance, which was 13th March 2005. Sarah: Hello Stephen. You seem to be enjoying your time performing in the West End. What has been the biggest difference between the Musicals and your time in Boyzone? Stephen: Hello Sarah. In Boyzone you were just singing and being yourself and I usually sang most of the high parts. On stage in musicals you have to act and be someone else and the singing style is very different and the performance is also quite technical. Sarah: Have you enjoyed playing an evil character over the past few months? Stephen: I’ve really enjoyed it. People didn’t really expect me to be able to pull it off but hopefully it’s got me past having the tag of being the ‘cute one from Boyzone who sings high’! Sarah: Are there any people in the theatre world who you particularly admire / would like to star alongside? Stephen: I would love to play opposite Idina Menzel who plays Elphaba in Wicked on Broadway. I think she is incredibly talented. Sarah: You released a pop album shortly after Boyzone. Is this something you would like to go back to? Or are there any different styles of music you would like to try? Stephen: I’d like to do an album of songs from musicals but using songs from more current musicals like Wicked, Rent etc that I would really like to sing. Sarah: Do you have any ambitions outside the music industry that you would like to fulfil? Stephen: I’d like to be a successful director or producer for TV productions. Its something I’ve been interested in over the years and I feel I could be quite good at it. Sarah: What do you miss most about Dublin now that you spend much of your time here in London? Sarah: You often post messages to your fans on your website. Is it important to you to stay in contact with them? Stephen: I do think it’s really important to let you know what I am up to and to keep in touch. The support I get from the fans is fantastic. Sarah: Finally – you’ve recently filmed a stand-up comedy routine for a new TV show with Graham Norton. How nerve-wracking was this in comparison to singing in a Musical? Stephen: It was one of the most nerve wracking things I have ever done! I was so so nervous before it. In a musical you always know roughly how the audience will react. With this I had no idea what the reaction would be as I’d never done it before and I didn’t know if the audience would find me funny. You can judge for yourself how it went when its shown! Sarah: Thank you Stephen, and good luck with whatever the future may hold….! Stephen: And thank you Sarah for all your nice questions and congratulations on being the winning entry.